I’m so honored to have Betsy de Cruz sharing with us today. 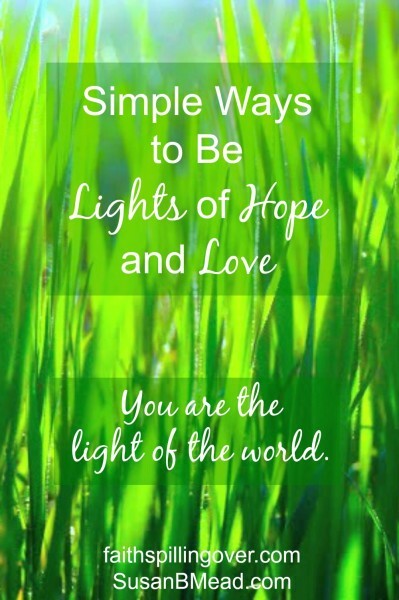 May you see the light of hope and love through her words. Be blessed! When was the last time you went to a prayer meeting in a public bathroom? Recently I found myself arm in arm with sisters I’d never met before in the women’s room at church. We prayed blessings over the life of a woman who desperately needed Jesus. It started when a slender, silver-haired woman walked up to me while I waited in line. She beamed a smile. I was confused when she held up a copy of Rick Warren’s A Purpose-Driven Life. I said I’d already read it, so she smiled and moved on to the next person. Pretty soon, my new friend found a taker for her book. She started talking to a young Asian woman. Come to find out, this woman didn’t know Jesus. Ana was newly-divorced and still hurting. After they talked a few minutes, Angie said, “Can I pray for you?” I was standing nearby, so I got pulled in too. A fourth woman joined us. As we interceded for Ana right there in the women’s room, tears welled up in her eyes. We hugged her, and one of the women gave Ana her phone number. Then I followed Angie out the bathroom door to ask if she always gave books away like that. Angie bubbled with enthusiasm. As I looked at her wrinkled cheeks, beautiful make up, and stylish clothes, she didn’t look much like Jesus. But then again, I was pretty sure I saw Him in her smiling eyes. What I saw was light. I saw the Light of the World shining through a slim, 70 year old frame. The Light of the World calls us to shine for Him. Angie shines Jesus’ light when she gives away Christian books. You and I might do it differently. 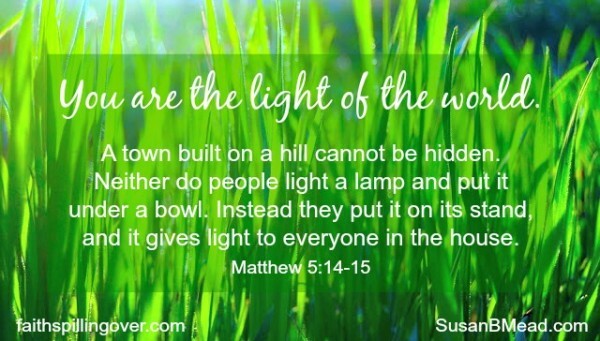 Maybe our lights shine as Christ’s ambassadors at our work places or at our kids’ schools. We shine when we invite neighbors for a meal. Recently I spent a beautiful hour at a Greyhound bus station; I talked with and prayed for three women who needed hope. Pray daily for non-believing friends and family. Be friendly and talk to people at the park, gym, or grocery store. Carry a tract or booklet in your purse. Look for an opportunity to give it away. Invite a neighbor to your house for ice cream on Sunday afternoon. Offer to pray for a non-Christian friend, either on the phone or in person. Invite a friend to church. How about letting your light shine this week? God wants to use you to bring love and hope to someone who needs it. Don’t be surprised by the joy you’ll feel as you reach out to others. Now it’s your turn: Have you had an opportunity to share Christ’s light lately? Does one of these ideas appeal to you? Betsy de Cruz enjoys God, life with teenagers and dark roast coffee. She and her crazy nomad family are currently in Turkey, their favorite spot on earth. Betsy’s passion is to encourage women to get God’s Word in, so their faith can spill out, even during life’s bumpy moments. 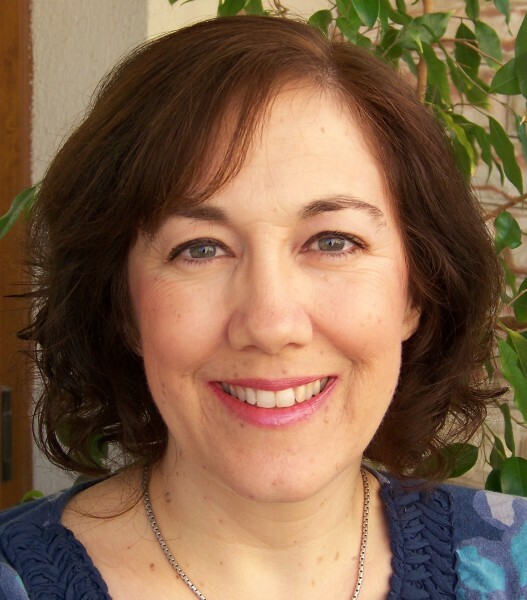 She knows what it’s like to have a family blow-up with fireworks during breakfast, and she writes about everyday faith at faithspillingover.com. You can also connect with Betsy on Facebook, Twitter, and Pinterest. Susan and Betsy, thanks for sharing your inspiring post with us this week – this was one of my favorite posts of the week! I love those moments God sets up with His perfect timing! And praise Him that you were being a noticer and stopped to embrace the moment! Loved this, Betsy! Thanks for sharing this at #MomentsofHope, Susan! What a beautiful story about spreading light. what a beautiful example and illustration for ‘living Jesus’ – Angie’s story really touched my heart. thank you for sharing! You can have prayer anywhere. That is a good thing. Thank you for sharing this story. It was a great example of a way to be light. I love how she used books to begin a conversation with people. I loved the story shared. It is amazing how opportunities can present themselves in the least likely places. May we always be prepared to share the hope we have as this world needs His Light more than ever. I am always blessed by Betsy’s posts! I am always encouraged and inspired by Betsy’s posts. May we seek to shine brightly for Christ to glorify Him. I love every one of your tips Betsy…I even try to keeps tracts in my murse(Man purse:) We need to be sensitive to God’s leading as we look for opportunities to shine brightly for Jesus. Have a fantastic week Betsy and continued safety as you and your family serve God. Thanks to you as well Susan for sharing these words of wisdom here today. Just love this, what a beautiful way to minister by giving out books, and what an opportunity to reach out to this you ng woman in need! I remember when I was an unbeliever going through a hard time, how blessed I was by women praying for me circled around my hurting self. What a blessing! I love this so so much!! thanks for sharing – i’ll share it, too. What a beautiful example to follow! I like Betsy! My friend does the same thing with books. In fact she picks up Purpose Driven Life all the time at thrift stores and blesses everyone she knows with that book! 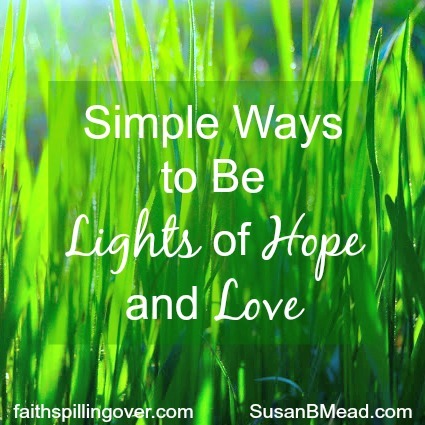 Susan, thanks for the linkup! Such wisdom here, to be actively searching for opportunities to live out our faith in common places. Thanks for the encouragement, Betsy! What a beautiful story! I want to be more bold like that. I like being nice to strangers, but it’s still hard to pray for them randomly in public like that! I had a similar experience in a ladies room somewhere in the southwest when our family was traveling and camping cross-country a few years ago. It was amazing, and it made me realize how close to the surface so many women’s grief lies. They are looking for a place to put it and someone to care. I need to get back to the practice of carrying books around to give away. Thanks, Betsy, for giving me a nudge. This is very inspiring. Betsy has so many little sweet stories that inspires. Thank you for sharing Angie’s story! So good to see you here this am…I need to be more intentional like Angie. She goes out everyday ready to share the Good News. I try to be especially kind to people that others are prone to give a hard time. Everyone can use a nice or kind word in their day. I like to buy coffee for the person behind me in the Starbucks drive thru and I leave a little note saying that Jesus loves them. I also like to ask people if I can pray for them…but there are so many opportunities to do more….people are hurting. Great post and loved the story of Angie! !